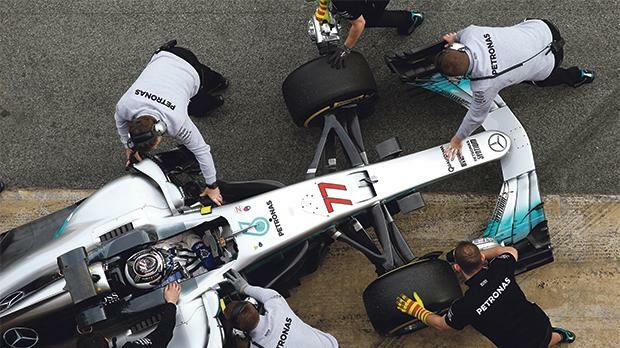 Valtteri Bottas’s Mercedes racing car is pushed to the garage. Valtteri Bottas ended the penultimate day of testing leading the way for Mercedes as rookie teenager Lance Stroll crashed out for the second consecutive day in Barcelona. Mercedes have been the class of the field this week and they reigned supreme once more yesterday after completing more laps than any other team. Bottas, the 27-year-old Finnish driver whose time on track was overseen by the man he replaced at Mercedes, Nico Rosberg, following his short visit to the paddock, also posted a time which would have been fast enough to be on pole position every year since 2007. Bottas managed 75 laps before Lewis Hamilton roared into action after the lunch break to complete 95 tours of the Circuit de Catalunya. For the third day in succession the reigning world champions were ahead of their rivals in mileage and Bottas’s super-quick time proved they have the pace to match as they bid for a fourth drivers’ and constructors’ cham-pionship. Stroll, the 18-year-old Canadian who has replaced Bottas at Williams this year, was the centre of more unwanted attention. Just 24 hours after his first meaningful running behind the wheel of a Formula One car lasted just 12 laps following a spin, Stroll was in the wars again yesterday. First, he lost control of his car moments before the lunch break and was stranded in the gravel. A pick-up truck was sent to collect him and his Williams. Then, in the afternoon, he ended up in the tyre wall at turn six after he crashed and sustained significant damage to the front of his car which called an early halt to his day. Meanwhile, Sebastian Vettel delivered another impressive show for Ferrari as he finished second in the order and completed a mammoth run of 139 laps – more than two race distances at this circuit. However, his car stopped in the pit lane in the closing moments of the day and had to be wheeled back to his Ferrari garage.